Details at the end of this column on how to win a copy of Death Among the Doilies by Mollie Cox Bryan from a past Coming Attractions column & a copy of a January 2017 book by Kathi Daley, Holiday Hangover. What better time to start a new series than the beginning of a new year? Here’s two that might interest you and plenty of old favorites. 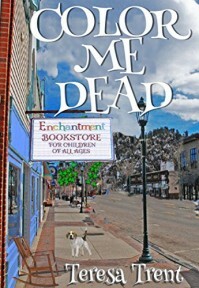 First up is Color Me Dead by Teresa Trent, the first in the Henry Park mysteries. Artist Gabby Wolfe has the ability to see the despair of the dead. Returning to her childhood home in Henry Park, Colorado, she brings along her brother and his beagle. When Gabby draws the death of a young woman before it happens, should she risk her new job and professional credibility? Trent is also the author of the Pecan Bayou mysteries. Where there’s a haunted mansion, there’s got to be a ghost. 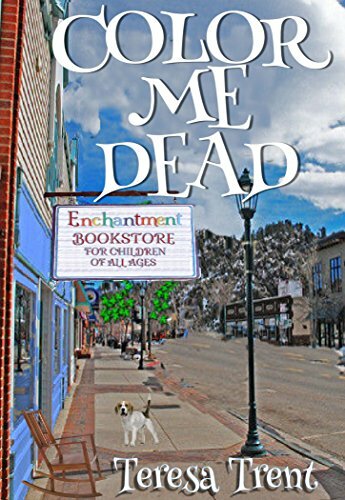 Melanie West is getting her life back on track after a messy divorce when her grandmother asks her to open a B&B with her. They buy a haunted mansion on the Oregon coast. While removing wallpaper they discover a skeleton in their closet—literally. The police suspect it’s the wife of the previous owner, but the locals are keeping mum. As the owners try to juggle renovations with investigations, a friendly ghost starts playing tricks. Then a body who looks a lot like Melanie is found stabbed to death on the beach. 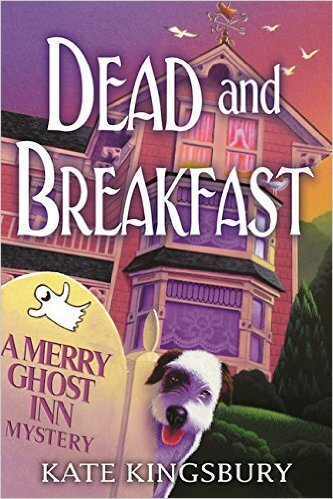 Dead and Breakfast is the first in the Merry Ghost Inn Mysteries by Kate Kingsbury, who also writes the Pennyfoot Hotel series and The Manor House mysteries. Another woman opening a B&B is Mallory Shepard. She hopes to unveil it in time for her first ceremony as a wedding planner. The renovations to Thistle Park—the mansion she inherited in small-town Port Quincy, Pennsylvania—are almost complete. What she didn’t plan on is the bride’s aunt being poisoned at the wedding tasting, which makes Thistle Park a crime scene. But this is not the first murder in the bridal family. Mallory learns the man convicted of that crime may not be guilty. Now she has two crimes to solve before the bride walks down the aisle—but a killer has other plans to ensure that Mallory forever holds her peace. 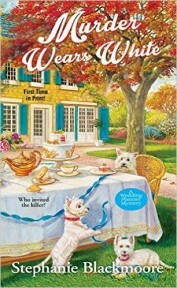 Murder Wears White is the second in Stephanie Blackmoore’s Wedding Planner Mysteries. Somewhere in a haunted castle in Golden, California, ex-detective and current reality show investigator Georgia Thornton and nine others have been tasked to solve the murder of a young woman who disappeared in the castle in 1960. When they arrive, the groundskeeper is found drowned at the bottom of the castle’s empty pool. 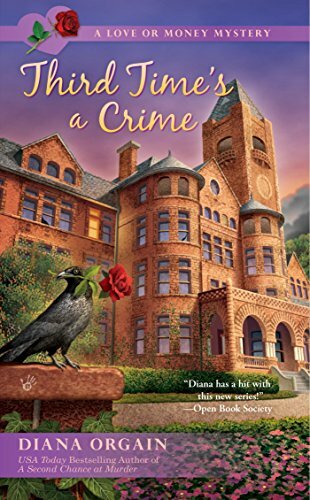 Third Time’s a Crime is the third in the Love or Money series by Diana Orgain who also pens the Maternal Instincts Mysteries and The Roundup Crew Mysteries. 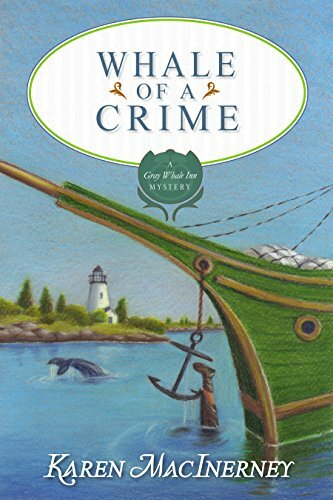 It’s a Whale of a Crime when a tour company books the Gray Whale Inn for a full week. Innkeeper Natalie Barnes can’t wait to get cooking and ride on an antique schooner to get close to the whales. When humpback whale drags fishing gear from its tail, the tour takes a dark turn. And then when the captain winds up six feet under attached to the anchor, it’s not by accident. Soon the tour naturalist is behind bars charged with a murder. A second body turns up just outside the inn, so Natalie has another to solve. Add a kitchen sabotage, an orphan kitten and a mysterious investor and you have a recipe for disaster. 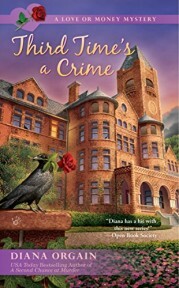 This is the seventh Gray Whale Inn mystery by Karen MacInerney, who also authors the Kitzi Camden Beading Mysteries, Margie Peterson series and the Dewberry Farm Mysteries. Still got gift cards from Christmas? Here’s some fictional shops to browse, or use the card. 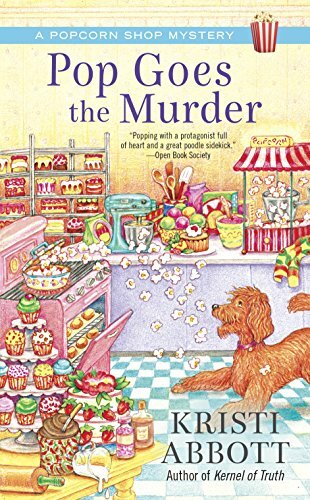 Kristi Abbott follows up her first Popcorn Shop Mystery, Kernel of Truth, with Pop Goes the Murder. Rebecca Anderson and her poodle, Sprocket, are back on the case in Grand Lake, Ohio. When her ex tempts her with featuring her gourmet shop POPS on his cooking show; the publicity is hard to turn down. Things take a shocking turn when Rebecca finds the assistant electrocuted in a hotel bathtub. The police want the ex for the crime but Rebecca knows he’s no killer. So Rebecca decides to bag the real culprit. Includes Popcorn Related Recipes! Maybe you need a new hat for the New Year. 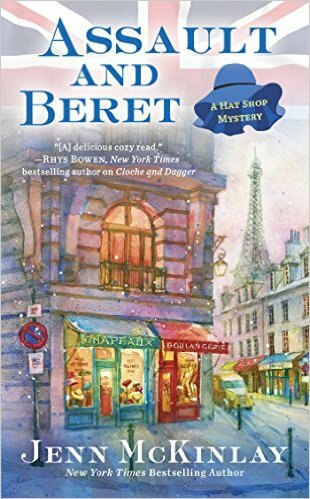 British milliner Vivian Tremont and her American cousin and partner, Scarlett Parker, leave their London shop, Mim’s Whims, to go to Paris to teach a hat-making class. Viv also wants to find the man she eloped with ten years ago to have the marriage annulled. He’s now an insurance investigator who works with priceless art. When he and a Renoir disappear, it’s up to the women to follow the clues. 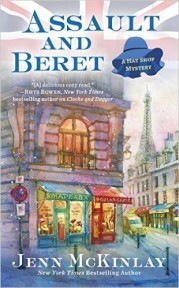 Assault and Beret is the fourth in Jenn McKinlay’s Hat Shop Mysteries. 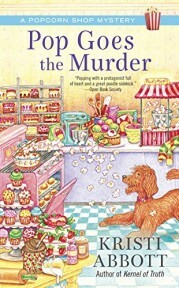 McKinlay also pens the Cupcake Bakery series and the Library Lover’s Mysteries. Next we’re off to Torte, a bakeshop in Ashland, Oregon. Jules Capshaw is prepping for the annual Shakespeare Festival and Chocolate Festival. Rival shop Confections Couture competes with truffles to die for—literally. The owner turns up dead right after sampling Jules 4-layer chocolate cake. What was the mysterious ingredient that could have done this? 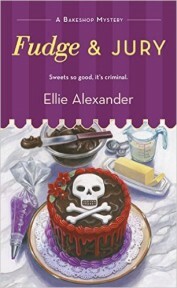 Fudge & Jury is the fifth in the Bakeshop series by Ellie Alexander. Want coffee with that cake? 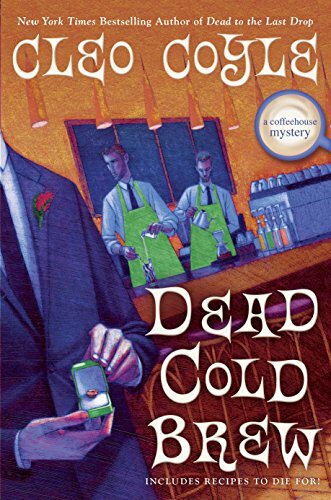 Cleo Coyle is back with Dead Cold Brew, her sixteenth in the Coffeehouse series. Manager Clare Cosi at Village Blend is thrilled when her NYPD detective boyfriend surprises her with an engagement ring. Her employer helps out by giving her coffee-colored diamonds and the name of a world famous jeweler. Trouble starts when an attorney shows up with a letter bequeathing a hidden treasure to Clare’s daughter. Then the renowned jeweler is found poisoned in his shop. Both events are connected to a cold case involving a sunken ship, an Italian curse, a charming jewel thief, and a family secret. Clare must track down clues in New York’s most secret places before an old vendetta starts producing fresh corpses. With recipes to die for, including how to make cold-brew coffee at home! To enter to win a copy of Death Among the Doilies by Mollie Cox Bryan & a copy of a January 2017 book by Kathi Daley, Holiday Hangover-simply email KRL at krlcontests@gmail[dot]com by replacing the [dot] with a period, and with the subject line “after holidays” or comment on this article. A winner will be chosen after January 7, 2017. U.S. residents only. I’m eagerly awaiting the books of 2017. I had a wonderful time reading in 2016! Thanks, KRL! Such a good choice, I adore giveaways and Happy New Year! So many new books so little time. Can’t wait to read them. Happy New Year! great giveaway good luck to me! Thank you for a Wonderful GIVEAWAY!!!! Two of my favorite authors!!! This was a great year for books and 2017 looks like it will be too!!!!! Happy New Year!!!! Some wonderful books coming out soon! I will be adding quite a few of them to my TBR pile. Thanks for the update! So many of these I’m looking forward to, especially Murder Wears White. I loved the first book in that series. Looking forward to reading these books in 2017. Thanks for the chance to win. Thanks for the info, Sunny. Happy New Year. Would love to read any of these. Thank you for the chance to win some great books to read. Thanks for the info on the January new releases. Looking forward to reading them. Thanks for the chance to win “Death Among the Doilies” and “Holiday Hangover”. Happy New Year! I really need to read this book! Wonderful selection of books. Some I am reading but there are so many others I am not….yet! These sound great! Another fabulous round-up with a whole buncha new books to add to my TBR! Great choices to read for the New Year. All of them sound wonderful actually. Thank you for the review and contest.